The .build domain namespace opened in General Availability in April 2014, as a domain name designed specifically for the online needs of the building industry and beyond. As the appointed technical provider for .build, ARI Registry Services powered the launch and continued technical operations for this global domain name. A year into the life of the namespace, ARI Registry Services' Head of Global Consulting Tony Kirsch caught up with George Minardos, CEO of .build to talk about his insights to date, what he's learnt about the domain name industry, and a look at where he thinks it is heading. Question (Tony Kirsch): Hi George and thanks for the chance to chat about the journey of .build. To start, let's talk about your general experience in the first year of the TLD. What have been some of the highlights? George Minardos, CEO of .build: The first year has been a combination of block and tackling of the basics of a new business while pushing for innovation in an exploding field. We came to the market ready to integrate into what we thought was a standardised process, but then learned that this wasn't the case. The changes that the new Registries and the New gTLD Program itself introduced, required the industry to create and adopt new systems and best practices. One of the most fulfilling milestones of our first year was to see the state of the industry gradually change over time in the direction we had predicted and promoted. It was quite a year to watch individual registrars go from not offering our name or any others, to hundreds of registrars and resellers offering our complete product including premium names and different price levels. Q: You established a number of partnerships with leading industry bodies. Why did you decide on this strategy? George: I see .build as an opportunity for the entire building world. My vision is to create a namespace that actually helps an entire industry improve. Builders understand the importance of their real world reputation and identity and are beginning to understand the importance of their online identity. We realised that this isn't actually that hard of a story to tell, especially if we could show a few great case studies: the story would then propagate and tell itself. We partnered early on with the Associated General Contractors of America (AGC) and American Subcontractors Association (ASA), two of the largest associations in the commercial construction industry. We have also been working very closely with The Blue Book Network, a 100 year-old company with deep ties and services in the commercial construction industry. These leading organizations represent hundreds of thousands of members. By getting them to effectively use, endorse, and adopt those domains, it is creating a broader awareness within the industry. More to the point, each group understands the need to innovate and constantly offer their customers value. Q: What feedback have you received from your customers? George: I spoke to a guy who was trying to buy a three-character domain that was selling for about $250 at the Registrar. He thought it was a bit expensive, compared with the general notion of what a domain costs, so I suggested he look up his desired name on a domain investing site and compare the prices. All the equivalent domains in other TLDs were worth thousands of dollars. And all of a sudden I heard the gears shifting on the other end of the phone and he was like 'this is cheap; I've got to grab it now!' He registered his domain name for the complete 10 year period! 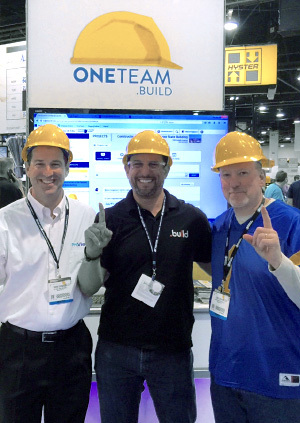 At the World of Concrete 2015 announcing Bluebook's OneTeam.BuildI think there's an opportunity to reset the consumer's notion of value. When you put a good domain name in terms of like-for-like, the whole notion of what's good value can change. There was a company called Saco that bought a .build in Landrush, and I actually went out and met with them because I was curious as to why they bought a .build. I sat down with the two founders of the company. They said there were 15 other Saco construction companies on the web and they saw .build as an opportunity to get the best name that was available to them and stand out from the crowd. For them it was a no-brainer. They developed a website and did some pretty innovative things like setting up different Twitter accounts for each of their projects, where the Project Managers were posting updates and photos and they were uploading automatically into a feed on their website. I think they had that up in less than a day with a website builder. We've set up a new page on our site — greatsites.build — to show some examples like this that are great representations of what people are doing with .build domains in so many areas. Q: What else have you learned about the scope of .build over the past year? George: When you start any business you wonder if you'll have customers. Imagine opening a restaurant and wondering if people will fill the tables. We knew we'd have customers but it's been really great to see how diverse they are. There are a broad number of other types of people interested in the name 'build'. We're seeing tech and start-up companies, innovators and DIY-ers — many people just putting their next big idea on .build. Something else that's really interesting is that from a consumer side, we've found many times that the consumer is price-insensitive. We've offered some specials through marketing programs and often people don't care to save $10, $20, or $50. They want to go to the easiest place to buy their domains, and if they've had an account with a registrar for 15 years then the discount to them is irrelevant. It's easier for them to just log in and buy the domain full price at a place they know and trust. What I have learned in that regard is that the pricing model of the domain industry where there is no Manufactured Suggested Retail Price does work, but it isn't one that I would have conceived of. 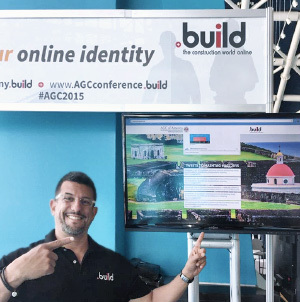 Sponsoring at the Annual AGC Conference in Puerto Rico March 2015Q: How have you dealt with the competition in the market from other TLDs? George: I've always said that a good domain name and therefore, a good TLD ultimately, is a name that means something to the person that buys it but also to the person that buys the good or service it offers. In short, a good domain is one you remember. I think all the industry TLDs are good and they're all needed, but I personally believe .build is the best for a number of reasons. It's the shortest and it also is broader than any of the more specific TLDs like .engineer or .construction. I think competitively, it stands on its own without any kind of differentiation needed. If somebody thinks that their company name and '.contractors' is better, then that is the one they should be buying. There are also peripheral TLDs like .property that are related, but they're distinct. I think that standing back objectively, .build is a different TLD entirely because it is more universally understood than any of the competitors. Q: Finally, what will be the main challenges and areas of focus for Year Two of .build? George: General Awareness to the New gTLD Program was and still is very thin. This is partly related to the lack of technical integration but it is also a marketing and messaging issue. You have the challenge not only of how to sell the product, but also in getting the message out there that the product is even for sale. I think that's going to continue to be the potential challenge — or opportunity, depending on how you look at it. There are organisations like the DNA and ICANN that are working to push the word out further. We're just going to continue to reach out in targeted ways that we find cost effective to increase the awareness of what new TLDs and .build in particular can do to improve a business' online identity. We need to ensure the awareness increases and good stories keep getting told enough to raise all boats in this tide, so that the whole program becomes more successful. 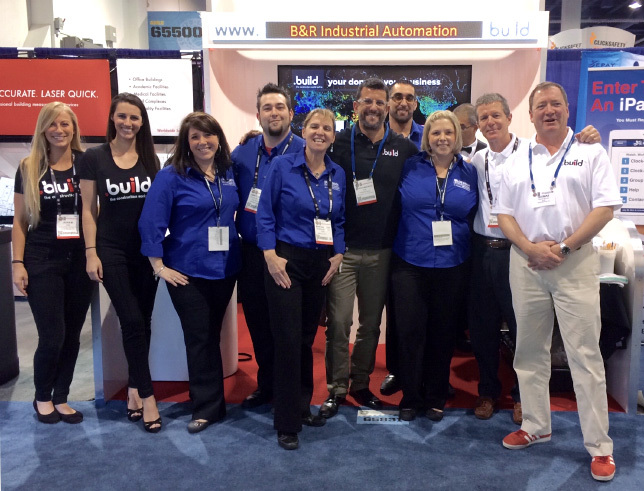 The .BUILD registry is using the right approach with partnering with trade associations to market their TLD. These member-based associations already have an existing relationship with the target market and thus have a far greater marketing reach than most new registries. Every TLD should be doing more of this. It certainly sends a signal to Registrars that the registry knows what they're doing. Local Time: Tuesday, April 23, 2019 09:00 PM PDT – Page Load: 0.3863 Sec.